For a number of years now, Christine has been resident in a care home, suffering from what is thought to be Vascular Dementia, the second most common form of dementia after Alzheimer’s Disease. 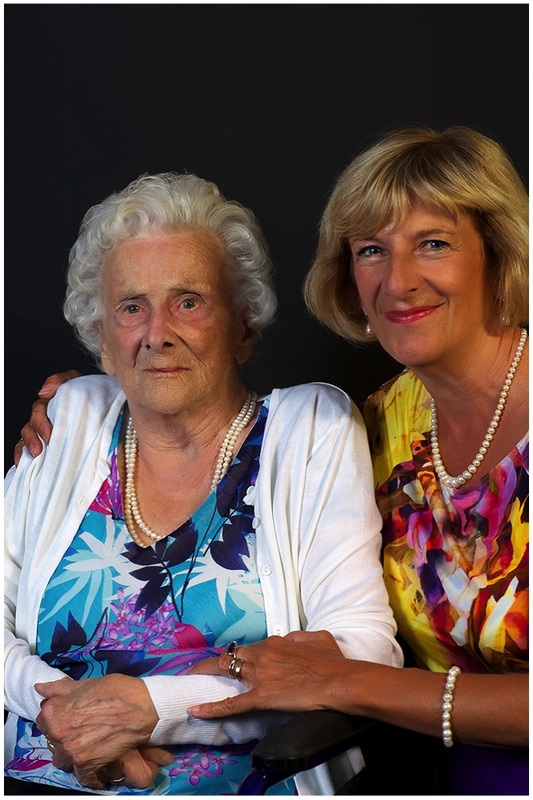 Now 92, she has largely lost the use of her legs and her speech is also severely impaired: her story here has therefore been told by her daughter, Vicki, who visits her frequently, spending many hours with her elderly Mum; their closeness is palpable. Born in Ipswich to an English mother, who later became a schoolteacher, Christine was the granddaughter of a publican. As a young woman, her mother, who lived at the family pub, had long harboured a fascination with Switzerland and all things Swiss and, perhaps for that reason, seemed strangely reluctant to be courted by any of the local boys. Then one day, a ‘dark stranger’, an Austrian raised in Switzerland, walked from the boat at Ipswich docks straight into her father’s pub; as soon as she heard the news, Christine’s mother was desperate to be introduced and almost immediately upon their meeting, romance was in the air. Love blossomed, marriage ensued and Christine was one of the two girls born into this somewhat atypical family. She had a happy time in her primary school though, sadly, her experience of secondary education was to be quite the opposite - it was a poor school which she absolutely loathed. Fortuitously, however, it was there she fell under the spell of an outstanding ballet teacher whose influence was both potent and beguiling; raised en pointe, as it were, from the dreariness of the classroom, Christine was introduced to the fairytale world of classical ballet where she was entranced and inspired by the dream of becoming a prima ballerina. At the tender age of fifteen, in pursuit of her dream, Christine joined the McLaren School of Dance in Kensington, living with some fellow students in lodgings in Soho which, in those distant times, must have offered some very enlightening experiences for a teenage girl from provincial Suffolk - perhaps the rigour of training as a professional dancer left but little time or energy for exploring the fleshpots of London! Christine’s talent and determination were soon recognised and, at the age of 17, she was already taking part in professional performances. However, the more she developed and explored her talent for dance, the more Christine came to appreciate, even at this early stage, that she would probably never outshine her equally-talented fellow students, essential if she hoped to rise to the sparsely-populated ranks of the prima-ballerinas. Later in life, to conceal what was an obvious and enduring disappointment, Christine maintained that it was the advent of the Second World War that had cut short her dancing career. Christine’s contribution to the war effort was to sign up as a probationer nurse; thus she was drafted into the nation’s service back in her home town of Ipswich, and while this was certainly a rewarding experience in itself, it wasn’t one that she felt entirely cut out for. However, the social life was pretty lively and, as it turned out, this provided her with the fortunate chance of lifelong happiness. During the Christmas of 1940, Christine agreed to deploy her considerable terpsichorean talents and danced in the Hospital Pantomime, thereby catching the eye of a certain Dr Christopher Grahame Fagg, a handsome young junior doctor; they married the following year, when she was 20. Shortly afterwards, Grahame was posted to India, to serve as a doctor in the Air Force, but he did get occasional leave and ensured that their time at home was spent productively: by 1945, Christine was the mother of two little boys. In 1952, following the family’s relocation to the medieval market town of Hitchin, in Hertfordshire, Christine’s third child was born, her daughter, Vicki. Grahame had secured his first NHS post in Paediatrics, having responsibility for most of North Hertfordshire, and a year later, Christine and Grahame’s fourth child, their third son, was born. While the austerity of the post-War period was very much an everyday reality, family life for Grahame and Christine was filled with activity, hope and optimism. Like most middle-class women at the time, Christine’s role was to be a homemaker, a housewife and the mother of young children; her husband, apart from being fully engaged in his medical work, indulged his passion for sailing, a passion not shared by Christine, alas. The years sped by: reaching her forties, with the children at school and growing up, Christine started to feel that there must surely be more to life than just being a housewife - her active mind, her need to channel her creativity, and her desire to explore, all began to surface. While her participation in church flower arranging, and a myriad of other local community activities, struck her as worthy, such pursuits became too mundane and demure to be satisfying, and though she enjoyed the companionship of many other women in the same situation, the thought of becoming a lady of leisure, once her brood had flown the nest, was not a prospect that appealed to Christine at all. Vicki says: “I can remember my mother becoming very depressed, even crying with frustration, because of her feeling that, outside of her family, nothing she did achieved anything that was meaningful.” She read avidly, often contemporary works by women such as Doris Lessing, Germaine Greer and Sylvia Plath, who were themselves challenging the conventions, and these writers stimulated her mind and helped to broaden her horizons. Husband Grahame, who derived immense satisfaction from his work, and who loved sailing too, was quick to acknowledge his wife’s frustration and, being the ultimate liberal he was, actively encouraged her to explore her talents and to contemplate what different avenues and interests she might pursue. A family friend, blessed with the necessary perspicacity and foresight, recognised Christine’s considerable powers of empathy and was instrumental in getting her a job with a group of women’s magazines, answering readers’ problem letters. In this role, she excelled, thereby launching herself into the world of journalism. (On the back of her role as an ‘agony aunt’, Christine published the first three of her books.) At around the same time, in 1961, Christine started to develop what seemed initially to be a quite separate strand of interest: leaving Grahame to enjoy his beloved sailing holidays, she began ‘single-handed caravanning’ with her two youngest children. While Grahame continued to welcome these developments, less supportive were her local women friends, most of whom avoided discussing the subject, seemingly threatened by her ‘other life’. Christine was becoming something of an outsider, simply because she had dared to break out of the contemporary social mould - she thought in a different way and she was open to exploring other possibilities. She was saddened by this but was not fearful of ‘going it alone’. In 1963, uniting her two new interests, she wrote her first article in Caravan Magazine, ‘A Woman Alone in Norfolk’, and from 1970 to 1985, she had her own dedicated page in the same magazine. During 1975, branching out further, she toured solo through 33 states of the USA in a motorhome, subsequently undertaking similar quests in Canada, New Zealand and South Africa. By then, she had become a member of the Guild of Travel Writers and contributed general travel articles to national newspapers and other publications. She wrote her first caravanning book in 1982 and a year later she was invited to launch her own personally-designed caravan, ‘ The Lady Go-Lightly’, featured at the Earls Court Caravan Show. Christine was now a professional journalist, writing extensively about her travels and explorations in the Americas, in Europe, in Asia and in Africa, not forgetting the United Kingdom. Having featured in a number of television programmes about caravanning, Christine was frequently interviewed on the radio and also for some early online publications. From the age of 85, Christine had been aware that her memory was beginning to fail and that her mind was undergoing changes beyond her control. She talked wittily about the notion that losing one’s memory was an example of Nature’s compassion, a sort of mental anaesthetic and a kindly way perhaps of protecting us from the reality of gradually ceasing to be compos mentis. Soon it was clear that she could no longer meet editors’ deadlines and, unable to finish her latest article on Malta, she found that requests for new contributions from her simply dried up. Vicki remembers how exceedingly painful it was to watch this happening to someone who had always generated good copy with such well-honed facility; her mother had written fluently for years, on many diverse topics and with great flair, her prose reflecting the sharpness and precision of her mind. Now everything seemed to be crumbling into confusion, with Christine succumbing to bouts of paranoia, even abut the security of her own home. In no time at all, invitations to public and professional events stopped coming in and, despite having quite deliberately forged new friendships following Grahame’s death, much of Christine’s new acquaintance rapidly withered away. The term, Alzheimer’s, is mentioned in polite society in hushed and fearful tones and gradually Christine was becoming the outsider yet again. Of course, where the bonds of friendship had been long-nurtured and strong, a few loyal and noble souls persisted, struggling to sustain their friendship with Christine and to help her as best they could. But gradually, almost all of them fell away, leaving Christine increasingly isolated. 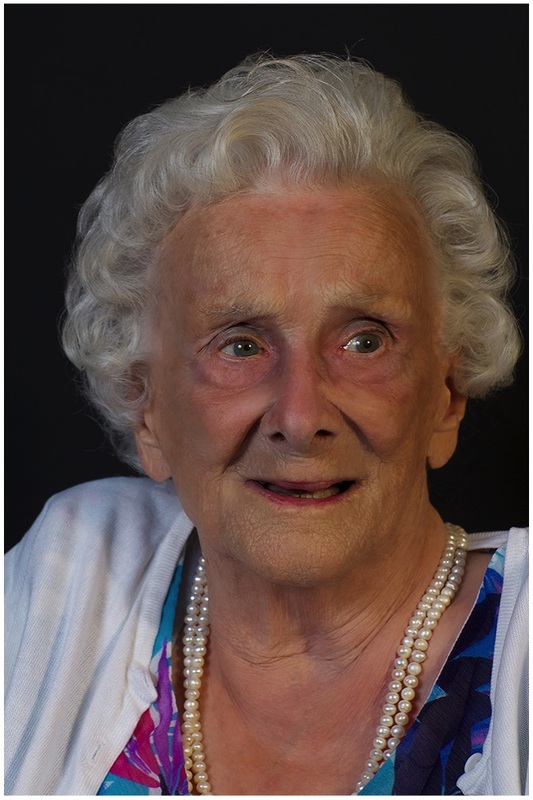 We have to report the sad news that, after her long battle with dementia, Christine Fagg passed away peacefully on 16th May, 2015. Her suffering was increasing day by day and her time had finally come; she well deserves her rest now. The team at Sloe Hill Residential Home, where Christine had spent her last years, were magnificent as ever, even suggesting to Christine’s daughter and son-in-law which of her favourite soft toys should accompany her on her final journey. Christine Fagg certainly had a remarkable life, with her talents, her charm, her curiosity and her adventurous spirit taking her through a long career, first as a ballerina, then through the Second World War, through a happy marriage and motherhood, and then literally to the other side of the world during her second career as a successful travel writer. It was a long journey and though she may have ended it as an ‘outsider’, Christine’s is undoubtedly a life to be celebrated, as the story above so comprehensively demonstrates. Christine is 92, a distinguished travel journalist; until comparatively recently she was writing about her independent travels around the world. However, for several years now, Christine has been resident in a care home, suffering from Vascular Dementia, the second most common form of dementia after Alzheimer’s Disease. She cannot walk now without help, her speech is severely impaired, and she is spending her fourth year in care. As the condition advances, so her faculties are progressively destroyed and she becomes increasingly an outsider in her own world. “Every time her condition deteriorates,” says her daughter, Vicki, “I find myself grieving again, feeling I’ve lost her once more.” Christine’s story is told by Vicki.